Now appearing at bridgetmckenna.com: Self-Editing for Everyone, a 12-part series for writers. It’s on the blog. 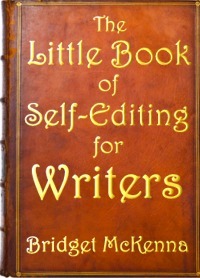 The Little Book of Self-Editing for Writers is available as an e-book for USD$2.99 at Amazon.com and all Amazon stores, and also at BarnesAndNoble.com and Kobo.com. This entry was posted in Editing, Writing. Bookmark the permalink.